Dedicated servers are in for Call of Duty: Black Ops. But sadly, hosting them yourself is out. Unlike its predecessor, Call of Duty: Black Ops will allow PC gamers to play on dedicated servers, but if they want to actually run one, it starts to get a little complicated. PC gamers will not be able to actually set up their own servers, instead they'll have to rent them from a third party. Activision has made GameServers the exclusive server provider for the game and players can pre-order a server now that will go live when the game launches in November. Ranked servers with room for 18 players cost $14.95 a month, with unranked servers costing $0.99 per player, per month. Support for voice chat carries an additional fee, costing anywhere from $2 for ten players, to $30 for 250 players. Discounts are available if the rental fees are paid in advance. 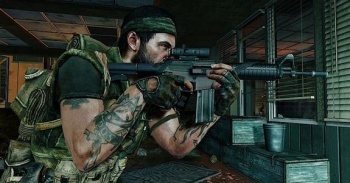 Treyarch's Josh Olin says that no one will need to rent a server in order to play online, as Treyarch will be hosting servers that players will be able to connect to for free, but he believes that the partnership will make it easier to handle cheaters and hackers. GameServers CEO David Aninowsky said that his company is committed to providing the best service it can, and that it is putting itself under a lot of pressure so that it exceeds all expectations. While it's still a step up from the complete lack of dedicated severs in Modern Warfare 2, this news will undoubtedly be disappointing to those who were hoping to host their own. Interestingly, EA used a similar solution for Battlefield: Bad Company 2, and it's not outside the realms of possibility that this could become the new standard when it comes to dedicated servers for PC games. Call of Duty: Black Ops will be released for PC, Xbox 360, PS3 and Wii on November 9th.